Chihuly Venetians is a stunning exhibition of 47 vessels, 12 drawings, and a monumental chandelier in the Venetian style from the George R. Stroemple Collection. 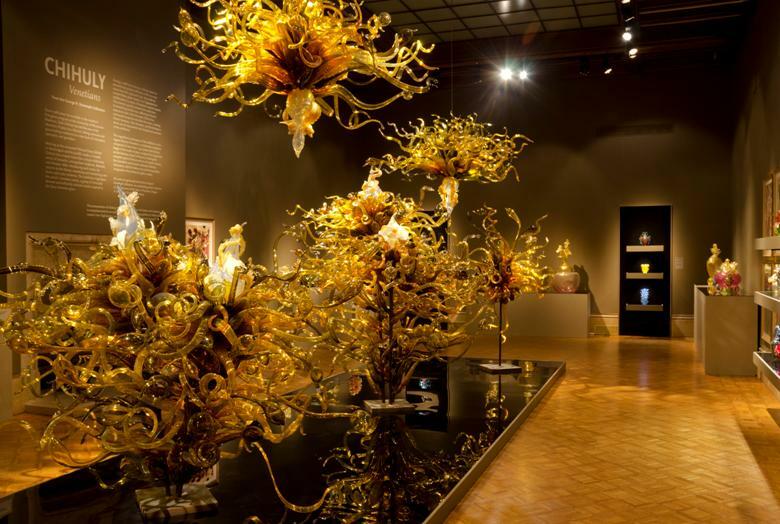 The most celebrated glass artist of our time, Dale Chihuly has taken centuries-old glassmaking traditions to a new level of innovation, spectacle, grandeur, and artistry. The Paine is proud to be the only Wisconsin venue for this extraordinary exhibition. Featured are works from Chihuly’s Venetians series—intricately formed and brilliantly colored objects inspired by Art Deco Venetian glass vases from the 1920s and ‘30s, which the artist saw during a 1987-88 trip to Venice. Chihuly described them as “...odd, with garish colors. Most were classical shapes with beautiful handles and other unusual additions.… I thought I would design some pieces similar to these, in the spirit of the period.… The series started a drastic change from rather refined classical shapes to very bizarre pieces: handles changed to knots, prunts became claws, colors went from subtle to bright, big leaves and feathers appeared.” Chihuly’s sumptuous Venetians are characterized by their vibrant color combinations, unusual forms, and fanciful ornamentation. Nearly four dozen vessels from the series will be on view, as well as a number of the artist’s drawings, which serve as independent works of art and “blueprints” to bring his designs to life. The highlight of the exhibition is the Laguna Murano Chandelier, a magnificent installation composed of more than 1,500 individual pieces of glass. With two elements suspended from the ceiling and three rising from the floor, the chandelier will be installed by a specially trained crew from Seattle. 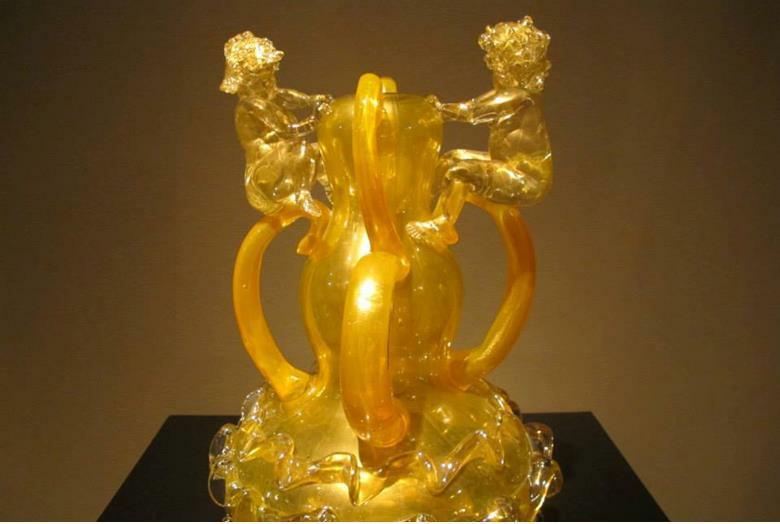 Upon first glance, the chandelier is a dramatic, sculptural confection of luminous amber and golden-hued tendrils, curls, and horns. 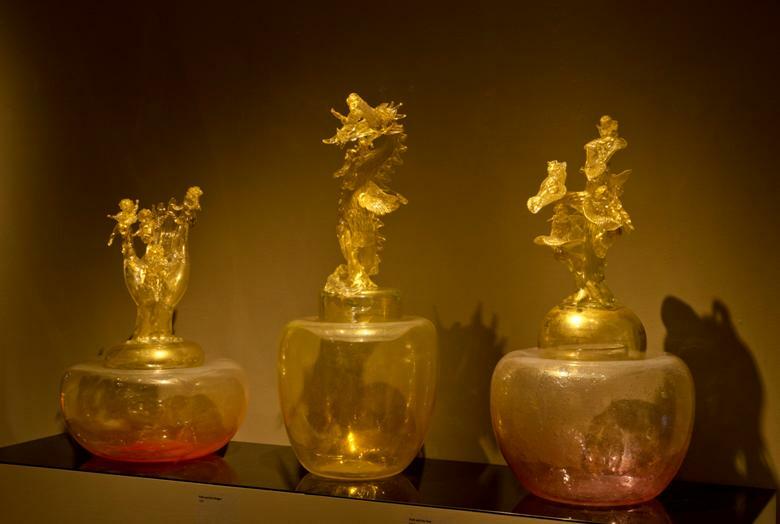 However, a closer look reveals whimsical details such as a mermaid, jellyfish, octopus, starfish, and other fantastical sea creatures inspired by the Venetian lagoon surrounding the island of Murano, where Chihuly collaborated with Italian glass masters Pino Signoretto and Lino Tagliapietra to create this tour de force in 1996. Many critics consider this work to be the most important Chihuly chandelier in existence. All works are generously lent by the George R. Stroemple Collection, an outstanding private collection of contemporary studio glass in Portland, Oregon. Photo by Stolley Studios, ltd.